What Makes Geo Modeling More Fun? Just thinking, as a general statement, the more accurate Google Earth is, the more people might be motivated to model. For example, higher resolution topographical data; more recent, and clearer, satellite imagery (especially "parallel projected" or high altitude imagery). Also better Street View images-- the clearer the better. I find myself avoiding modeling in areas where there may be an upgrade anyway. The more tools (and better tools) we have to model, the more it makes it worth while to model. And the more fun it is too. Labels: Google Earth, Terrain, Why Model? In truth I don't remember what was, exactly, the first model I made, but this one was pretty close. It was definitely the first one that made it to the Google Earth "Best Of" layer. I believe it was also first to appear in Burbank, California. 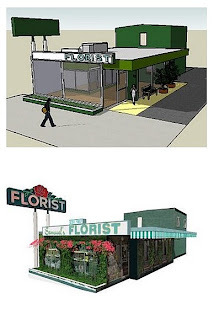 The model is of Samuel's Florist where I used to work. I did it as a gift for my friend and former boss Donna. In the illustration you can see one of the earliest incarnations of the model, made before Google Earth supported photo textures. Pretty primitive, huh? Also I went nuts with the geometry-- too much. I even did the inside, pedestrians, and articulated foliage (borrowed component). The current version (which appears on Google Earth) appears beneath the old model. Photo-textured, use of transparent PNG files for the foliage and canopy... much better don't you agree? It hardly looks like the same model. I may try to re-model it with better photo textures some day (maybe using Street View?) and more accurate geometry. But for now, I like it as it is. EDIT: If you enjoy looking "behind the scenes", have a look at these posts about other models I've made. Labels: Buildings, How To, Why Model? Why Aren't the Ladies Modeling???? Sure to cause a stir in the SketchUp World, Cathy Tritschler's humorous model explains it all (recommended download). Dear Lost: The first thing to do when creating a geo-located model in SketchUp is to import the location's terrain from Google Earth (Tools>Google Earth>Get Current View). You'll need both your SketchUp document open as well as Google Earth. Google Earth should be showing the location you want to model from directly overhead (use the "R" button get overhead view). Make sure your terrain is "on" (bottom of list on left GE menu). After all this is set up, click "Get Current View" in SketchUp and it will import the piece of terrain showing in Google Earth. Now you can model on top of this terrain. Don't worry, the true geographic axes are "built in" to this terrain, though not visible. The other axes (red/green/blue) are totally independent from the geographic axes and are there as a tool for modeling only. You can change these axes' positions at any time in the (Tools>Axes) drop-down menu. It won't change where north or south is, trust me. Good luck getting out of the woods! Bottles are floating up everywhere! I've decided to address some of the questions posed on the sea-soaked pages contained therein, in a new blog series called "Dear SketchUp Island: Questions of SketchUp Etiquette." Dear Concerned: This is a common problem, so don't feel alone. Hiding edges is as simple as editing the component by double clicking on it, then choosing a wireframe view from your SketchUp menu (View>Face Style>Wireframe). Select all the edges and in the right-click menu choose "Hide." And you are done. To hide the whole component, don't edit it, just select it and perform the same operation (right click, hide). Just a short note to say thanks to the many people who have stopped by SketchUp Island from all over the world. Viewers from at least 55 different countries have had a look in the first week! Also thank you to the special viewers who have selected the "follow" option in the sidebar. They are a small but growing group. Why not join them? I want to call attention to the latest follower, Sidewalk Astronomers, which is a philanthropic group doing some fantastic things in the world of amateur astronomy, specifically "Sidewalk Astronomy." This means they go out into the public and share their telescopes with others so that everyone may see the starry skies up-close. Here you can find useful information on upcoming events, and even plans which teach you how to build a powerful telescope yourself at a low cost. Again, thanks to everyone and-- see you around the Island. I'd like to give you just a short glimpse into a project I've been working on (slowly) since 2006 or earlier. Some models you just don't want to rush, and this is one of them. New York Penn Station once stood in the same spot where Madison Square Garden and Two Penn Plaza now stand in New York City-- the block between 31st and 33rd Streets bordered by 7th and 8th Avenues. 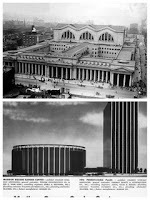 Through some internet sleuthing I was able to locate and download thousands of photos of Penn Station, and even some handy floor plans and elevations, and then translate those things into 3D space using SketchUp. I am using SketchUp simply to understand the "ghost" of the building better. It is amazing to be able to piece together the demolished walls, the arches and columns, and the vast spaces and feel, definitely, as if I have some understanding of what it was to be in that place. A complement to still photography. But, I'm taking my time. What's holding me back is the desire to be accurate. As I learn more, I realize what I have done up to now is often inaccurate. I have created and tossed out three generations of models so far. Another problem is, how to balance detail with file size (appearance vs. performance). I'd rather not break it up into pieces. But the actual building was vast-- covering two entire New York City blocks (32nd Street was "absorbed" and became the central axis to the building after the site was razed in the early 20th Century). These are some screen shots of the latest incarnation of the model. Not much there. But, maybe fun to look at and imagine what once was. Incidentally, this model appears as the icon for my "Golden Age of Rail" collection on the 3D Warehouse right now. For a sense of scale, notice the small dot on the middle left image-- that's a person. EDIT: Why is it called New York Pennsylvania Station? Well, back in the glory days, Pennsylvania Railroad was one of the powerhouses of rail. All along its lines, the stations were named very often "Pennsylvania Station." That is why there is a Pittsburgh Pennsylvania Station, a Newark Pennsylvania Station, and a New York Pennsylvania Station (although all that remains of the last is its basement). Labels: Buildings, Famous Buildings, How To, Why Model? No food. No water. Days of hunger and thirst. The herds of coconuts were evasive as ever, driving me to higher and higher elevations in search of my vittles. I found myself stumbling aimlessly towards the top of the fiery volcano in desperation. Perhaps there would be a mammoth I could hunt and eat? More likely a creature would hunt and eat me. As I ascended to the very rim of the hellish lava pit, I saw a great hulk of a man (as tall as a bear!) silhouetted against the fire, battling with a Tyrannosaurus Rex! "Help me! I need your help!" he cried. I jumped right in and began to wrestle the dinosaur alongside my new friend. I asked him some questions, too. Labels: 3D Warehouse, Buildings, SketchUp Island Adventures, SketchUp Islanders, Why Model? I was wandering around the shores of SketchUp Island this evening, minding my own business, when I spotted a seashell. Of course, I put my ear up to the seashell to hear what the ocean had to say. But instead of the ocean, I was surprised to hear a transmission from a secret agent from within the bowels of Wonka Land (code name for Google Office in Boulder). Secret Agent B.P. (aka Cyclist One) at Google has informed me that the imagery update in Peru was in fact in error. Therefore, in about one month the area will be corrected (with the next update). So, hold on to your buildings and don't move anything, or you'll have to move them all back again!! Time for a few basic SketchUp photography tips. Having problems with your SketchUp building photo shoots? We can work it out. Here is a list of some fab tricks that make life easier. 2) All you need is... proper exposure. Avoid backlighting by manually exposing for a lower part of the building, then shooting the higher parts against the sky. Backlighting is what happens when the bright sky causes your building to look too dark in the photo. You need to override the camera's automatic tendency to expose for that bright sky (see your camera manual). 3) Cry for a shadow? Some prefer to shoot on bright, cloudy days to avoid hard shadows. Others desire those shadows and will rapidly move around the building(s) on sunny days to capture this dazzling sunlight in a consistent pattern on all surfaces for an ultra-realistic appearance. I sometimes use Google Street View (easy to do using Picasa for screen capturing). In Street View the shadows are sometimes hard and the sunlight is crisp but I think it looks good when several adjacent buildings are modeled from the same light source (which is totally possible with Street View). In other cases I have painted textures "from scratch" when photos were not good enough. There are many approaches, and in my life I've loved them all. Just "don't make it bad" is my motto. In case you missed any, check out the SketchUp Island Adventures links here. These are my favorite part of SketchUp Island so far! The newest interviewee is "Aerilius." For some good reading click the links below. Late one evening as I was coming back from an unsuccessful coconut hunt I noticed a raging fire at my camp site! I could smell aromas of delicious Sauerbraten mingling with Spätzle; and as I approached I noticed a strange guest - as ragged and stranded as I - seated on a stump by the light of the fire and holding a stemmed glass filled with sparkling pink water. I had to know who this man was and what was in his glass! Luckily he invited me to sit down and share the meal he had made. Hello, Fellow Islander. Who are you? In the 3D-modeling world, I am known as Aerilius. I study chemistry in Kaiserslautern in southwest Germany. I am involved in modeling famous buildings and attractions in my region, the Palatinate, mainly for touristic reasons. Since we can't find our way off SketchUp Island, let's look into the future... all the way to the Year 3000. Where do you think geo-modeling is headed? Although we have been modeling for some years now, there are still 1 - 2 billion unmodeled buildings on earth. So we always chose to model a selection of the best and most famous ones. Geo-modeling gives the possibility to choose historic buildings, museums, also shops and companies and make them outstanding in a "barren land" in Google Earth. While Google advances with automatic techniques, our new goals could be improving the level of detail. I could think of "interactive" museums or historic ruins where visitors can also go inside and inform themselves. Google already mentioned something about info bubbles with rich media content. This Sauerbraten is the best. While I stuff my face... Why don't you talk to yourself for a while? What brought me to 3D-modeling at all? As a child, I always was a creator and I was fascinated by 3D animations in TV documentaries. Once I found the free program Blender, but I got clobbered over the head with hundreds of unlabeled buttons. So now, Sketchup is for me something like continuing LEGO with simple tools and undreamed-of possibilities. I like retrieving ancient worlds back to reality. Moreover it combines photography, 2D computer art and architecture. Margaret Thatcher and Helmut Kohl once sat to a state dinner, not knowing what to say to each other. Finally Ms. Thatcher raised her glass and said, "To your HEALTH Herr Chancellor!" Mr. Kohl then raised his and said "Prime Minister, to your DUNKLES!" So... Dunkles oder helles? That's a good question. I like to answer "Schorle." That is a refreshment made of white or rosé wine and sparkling water. Because I live in a winegrowing area. But when I am out in the wild, in the rest of Germany, I prefer helles. Excellent choice, Aerilius. Thanks for joining me in this conversation and for explaining the sparkling pink water in your glass. Have any to spare? Labels: SketchUp Island Adventures, SketchUp Islanders, Why Model? A request for your assistance actually. But first of all, thank you for caring enough to spend time on SketchUp Island. I'm flattered! If you like the blog (as far as I can tell, some of you do for some reason) then pass on the message. Tell your friends who might like my weird blog all about it. Put the web address sketchupisland.blogspot.com in your email footer. Beg relatives to share in your strange new habit of visiting SketchUp Island. Tell the postal man and the milk man and the baker. Teach your dog how to use the Internet and then tell him to look at SketchUp Island. Call up your old schoolteachers and tell them "I've made something of myself. I've BEEN to SketchUp Island." Stop your car in traffic and get up on the roof and tell the other drivers (no, don't do that, it's unsafe!) Next time you're in McDonald's, ask for the #1 Value Meal with SketchUp Island instead of fries. When the cashier says "um... I need to ask my manager about that..." tell them to tell the manager about SketchUp Island. Tell the manager to tell his district manager about SketchUp Island. At the bar, try out this pickup line: "Is that a twinkle in your eye? No? Hey check out this cool web site called SketchUp Island... WAIT! COME BACK!" 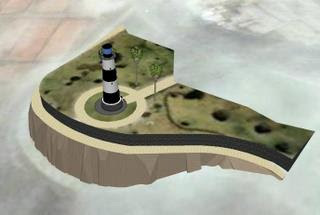 When you dream, make sure you dream about SketchUp Island. If you happen to be at the mall and you see Jon and Kate Plus Eight walking around, avoid them. I think they're going through some rough times, personally. The Crooked Houses were sort of like a metaphor, huh? 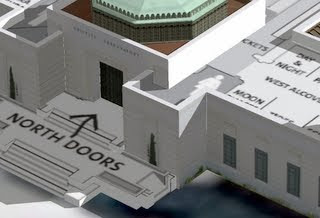 Anyway but tell the entourage of crazed fans around Jon and Kate all about SketchUp Island. Tell your Head of State. Tell your clergy. Tell your funny neighbor who doesn't ever talk to you. Argentinians blogged about how 80 percent of their nation was now available in luxurious high-res. Americans anxiously scoured the corners of their nation to see what was updated. But for an unfortunate few the imagery push was not what they hoped for this time. Modeler and fellow SketchUp Islander Auquicu informs me that parts of Lima, Peru, were updated with older and lower res images. 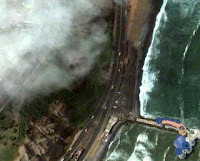 There was also an imagery shift that left many of the already-modeled 3D buildings slightly off to the side of their foundations, and last but not least... parts of the beautiful Peruvian coast which were previously clear, now include cloud cover in the satellite photos. Sorry to hear you've had a bad day, Auquicu. I'm sure that updating imagery for Google Earth is a very complex process, and these things are bound to happen. Hopefully the kind people over at Google will notice soon and fix it! 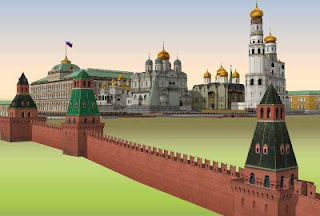 SketchUp Islander Aerilius has created a beautiful set of 3D SketchUp models of the Moscow Kremlin. They can be viewed individually and also as one entire group (see illustration). Check out his models on the Google 3D Warehouse! Today I was exploring mountainous regions of SketchUp Island I'd never seen before when I came across this fellow marooner, Néstor Suárez. Unfortunately, neither of us had eaten in three days, and so we went hunting for coconuts together. Here's what we talked about along the way! Tell me about yourself, Fellow Marooner? For those who don't know me, I'm Néstor Suárez, or "NESUA", as I'm known on the geo-modeling world. I'm a student of engineer computer from Buenos Aires, Argentina. I help to model the buildings of my own country, just to work on something important and that I think has a great future. Geo-modeling is in its infancy. Aside from being cool, many people don't know what it's for. What is your vision for the future direction and significance of geo-modeling (or 3D in general) to regular people? I think geo-modeling is great because people can use it to visit a lot of places virtually before going, and it's a great way to stand out from the rest, the various entities can use it to showcase their facilities. Now at the present you can see some 3D in the GPS of cars, that shows some important buildings on the way as a guide. That adds a lot more reality than a linear and flat map!... I don't know what the future will bring us with the 3Ds but I think that this is the future of 3D modeling, the geo-modeling, and we are just starting with that. Why I started with this? I don't know exactly, but in the beginning I only want to put the building where I live in the Google Earth. I just wanted to try it, like a test to myself, and I did it! Why I continue if I had achieved my goal? Because I found that there were still many important sites [to] add, and above all, there was a previously unknown small community trying to do the same, that helps, assists, and gives you confidence and support to continue. And that is not found everywhere. Goofy question: beach or mountain? Mountain, I like so much the mountain air, being able to sit in a creek, walk to the top as a challenge and touch the snow, that makes me very happy. I am glad Néstor likes the mountains and snow, because we were eventually able to locate and apprehend some coconuts, providing sustenance and hydration for some days to come. Thanks Néstor for sharing! See you around the Island. Labels: 3D Warehouse, SketchUp Island Adventures, SketchUp Islanders, Why Model? I just added a model called "Monument Airborne, Oosterbeek, The Netherlands" (by the hague) to the "Sculptures and Monuments of the World" collection which NESUA has shared with me on the 3D Warehouse. Both models and collections can be shared for collaborative projects. For this project I was lucky enough to find some floor plans online. At the time, the Google Earth terrain in Los Angeles was very wonky and it would have been hard to get a clear "footprint" of the building. The actual hilltop site has been leveled off since 1930 or thereabouts, but our Google Earth hilltop was very rounded like... a hill (now the GE topographical data is very high resolution and the hill is manicured into a flat lawn, just like in real life, but not at the time the model was made). I began the project by importing the floor plan into SketchUp as a flat image. I was then able to easily trace the foundation and extrude the shape to the correct building height and add other things like turrets, domes, and copper roofs. As the model progressed, the original floor plan disappeared bit-by-bit, to be replaced with glorious photo textures which add so much realism to the final product. One thing had me stumped-- how was I to texture the three large domes on the building? In real life they were copper with a beautiful patina and other signs of aging and character. 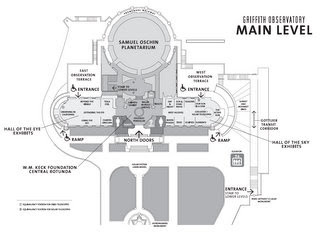 (One houses the sun scope; another the telescope; and the biggest of all looms over top the planetarium). How would I take a photo of a curved dome and apply it to a bunch of flat surfaces (because, if you don't know, everything in SketchUp is flat-- even "curves" are really just a bunch of flat chips put together). 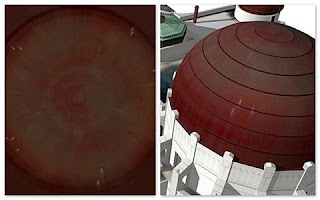 The copper joints running around the dome were made simply by creating additional, horizontal bands of geometry and painting them with a flat dark brown color. But, this created a lot of excess polygons. I have some other solutions to copper dome-making that I want to try out. I'm actually re-doing the Observatory model, and what I have so far (thanks in part to much more accurate topographical data from GE) is about one-and-a half-thousand times better than this. EDIT: I had used SketchUp as early as a couple years prior to this, but I made this model within a few months of using SketchUp in earnest. Labels: Buildings, Famous Buildings, Google Earth, How To, Problems, Terrain, Textures, Why Model? Today the ongoing discussion about Women and SketchUp takes us from the shores of SketchUp Island all the way to the coast of France, where SketchUp modeler Cathy Tritschler has created many of the 3D Warehouse's most beautiful models of lighthouses. Cathy also shares some of her feelings about why she is motivated to create models for Google Earth. "Using Google Earth to travel virtually through the world, I enjoyed seeing SketchUp buildings, which gave a very realistic idea of countries I’ll probably never visit. Then I thought why could I take this and not give in return ? So I’ve downloaded SketchUp. "When I began modeling, it was a personal challenge. I’ve never thought about the social aspect of it and I was very surprised that other modelists made comments about my models and to receive emails through the 3D Warehouse. I’ve made a few pen friends now and I must say that I enjoy it very much, but it isn’t my motivation. My goal is only to give models to see freely to all of GE users. I try to make models better and better as I learn how to do with SketchUp and I’m very grateful when a modeler send me a technical tip. In brief, all is about sharing freely. "Living on the Brittany coastline, naturally I began modeling lighthouses, first of all because they are very helpful to navigate safely along our difficult coast where there is a lot of rocks and islands, and secondary because they are complicated buildings and I wanted to pay my tribute to the men who gave sometimes their lives to build these monuments (most of all situated on isolated rocks) despite of wind, bad weather, stormy sea… to save other men’s lives. It’s still about altruism. We owe them recognition as well as other builders who left us a cultural heritage. "To come back to the topic of why there isn’t a lot of female to get involved in geo modeling, maybe it’s the lack of time : having a job at daytime, cooking, washing, ironing, rising children after work take most of the day. Now that I have no more child at home only a husband, I have more time. May be sirs could you help us a little more ???? (I think I’ve no friend anymore !!!!). More seriously, my opinion is that it’s a matter of temperament : some little girls prefer to play with Lego than a doll. It was my case, I was very curious and I wanted to know how things worked. 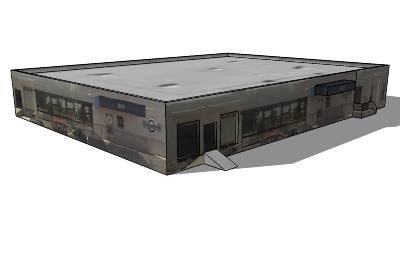 Modeling for 3D Warehouse allows to understand in detail the methods of construction over the centuries. At first I try to find the building plans and all the historic documentations, then I use them to make the more exact models and understand how and why they were built. I’ve told you I’m curious ! Now a lot of women make DIY, so hopefully in a near future there will be female modelists. (Sorry for the language mistakes, I hope you’ll understand my point of view and that I still have a few friends…?)" "This is a subject very near to my heart for lots of reasons. I LOVE SketchUp and seem to learn new tricks with it all the time, every time I use it. That's really the attraction for me, the creative urge to make something real in a new way. I also love the whole problem solving process in geo-modeling. You know - how to figure out how to make the roof attach to another the right way, or figuring out how to create something that looks like a fire escape without using 5 million polygons. I think I've learned more about photo processing software as a result of needing to create the right textures for SketchUp models, too. I have seen my knowledge grow as I make the models, and I derive a lot of pleasure in that. they are young. Girls are given more opportunity to play with fantasy, for lack of a better way to explain it - such as dolls, doll houses etc... they really enjoy pretending to put a house together (on the inside) and boys really enjoy building bigger things that represent more concrete ideas. This doesn't mean they can't model for Google Earth though, they just need encouragement to think it's appropriate, and chances to try it out. I think. "Looking at my own models and the collections I'm working on, I see the ones that I love the most are kind of little compared to some of the bigger models I have seen. Little, and many have a sentimental meaning for me... like the Mark Twain house... I love the author's writing so I wanted to make him a spot in Google Earth. Although I do enjoy a skyscraper every once in a while!!" Beryl Reid is an educator of second-grade children and adult students. She has an education in the visual arts and enjoys paper sculpture, sewing, and quilting. 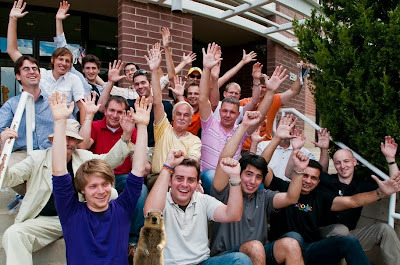 In August 2009 Beryl attended the Google Teacher Academy at the Google office in Boulder, CO. "I was in heaven being in that building!" she writes. "It's like my dream come true." John Wilkes is at it again! John, who we heard from in the last post as well, has been interviewed again by the BBC. John was a very enjoyable person to meet and some of his personality can be experienced in the audio interview clip below. Have a listen to John describing his experiences as a modeler of the town of Dursley, England, and the good times had while visiting Boulder Colorado for the Super Modeler Conference in August 2009. Labels: SketchUp Islanders, Super Modeler Conference, Super Modelers, Why Model? Blog Viewer and grade school teacher Beryl Reid has sent a video in a bottle to SketchUp Island demonstrating SketchUp's appeal and ease of use for young people. Also, an example of (young) women as SketchUp users. We'll be sure to hear more from Beryl in the near future. Thanks, Beryl! So, who are you, fellow Marooner? For those who don't know me, I am MILO Minderbinder, a Geo-modeler for Google Earth. I usually create buildings that are located in Miami Beach (because it's a wonderful place), but I sometimes build other things like a rice cooker, or an alarm clock. What role will geo-modeling play in the future of everyday people? I think Google SketchUp will always be used for Geo-modeling for Google Earth. It's also helpful for architects and designers, but before you can use it, you first have to know it exists. And I think too little people actually know SketchUp. Most of the people won't even try it, because they think it will be just as tough to use as Adobe Photoshop (I'm the worst with Photoshop). But I guess 3D software has a great future, as it is already used in Hollywood; and whoever tries SketchUp, will be able to succeed in becoming a good modeler. Like we say in Dutch: Niet geschoten, altijd mis! Ah, yes. Ask yourself a vital question and answer it, please. Nobody has ever asked me "Why is your nickname 'MILO Minderbinder?'" The answer to that question isn't that hard to answer, but it will require some history-digging. The first model I uploaded was the Fairwind Hotel, but I uploaded with the nickname 'Kaaskip' (means Cheesechicken). But I lost my password! So I created a new account with nickname MILO Minderbinder. MILO means Miami Lover. I never told anyone that before, except for the review I commented on the Fairwind Hotel by Kaaskip. And why Minderbinder? Milo Minderbinder is the main character in the novel Catch 22. Chocolate of course! I love chocolate. In Holland you can't buy any good chocolate ice cream. The best chocolate ice cream I ever ate, was at Painter's Homemade ice cream in Myrtle Beach. Second best was Bruster's ice cream in Chesterfield (south of Richmond). For anyone willing to try Google Sketchup; go ahead! it's free, so why not? I'm sure it'll catch on and you'll like it. That's it! Thank you MILO. Who else would like to join MILO and me on the Island? Sometimes it feels lonely on SketchUp Island. Therefore I have decided to do a series of what I call "RSI's" (Really Short Interviews) in which I will lightheartedly quiz members of the geo-modeling community about their experiences with SketchUp and geo-modeling and their views about the future of it all. By the way if any enterprising designer wants to design a little logo for the RSI that can be placed in the posts, feel free to send it in. Maybe I'll even use it. Don't knock yourself out though. 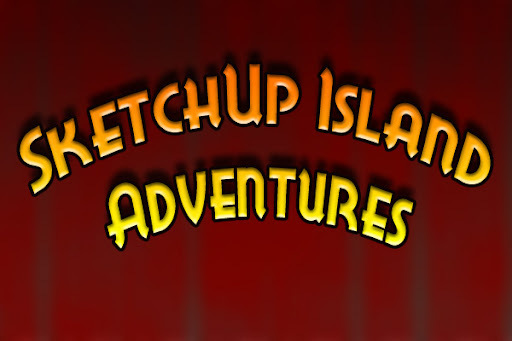 EDIT: The series has been re-named "SketchUp Island Adventures" so keep an eye out for that starting October 2009. BAD Terrain Data! NAUGHTY Terrain Data! What happens when the Google Earth terrain data doesn't cut it? The satellite picture is fuzzy. The skyscrapers seem to be lying flat across the ground. A hill appears when there is no hill in real life. You want to make a 3D model that integrates with the terrain nicely, but you can't! What do you do? Do you surrender? Or do you FIGHT? Ever wondered what every single American state capitol building looked like? I have. I once got a cool book from the library that was a photographic tour of all fifty state capitol buildings from Delaware to Hawaii. You can also view all fifty buildings in virtual 3D here on Google's online 3D Warehouse in the collection I call American Capitols. There is surprising variety to these buildings. Many are what is called "American Renaissance" style-- the typical capitol you think of, a bunch of Roman columns with a great dome in the center. But some are Art Deco office towers, others are round, or modest (check out Alaska's), and some are just plain ugly (sorry, Florida). Most of these models were made by Google, but one (Minnesota) was made by a 3D modeling group called Blue Marble Project. I've been working on my own Minnesota model, but ran into some technical difficulties (bugs). Hopefully some day I can share that one. It's pretty cool. EDIT: Newer versions of SketchUp now integrate Street View Texturing which saves a lot of steps! This model is the first I ever tried using Google Street View for textures. It was actually pretty easy to do. used free Google Picasa photo editing software as an image capture tool. All you do is have Street View open in either Google Maps or Google Earth, and press the "PrtScn" key on your keyboard (I'm using a PC, maybe Macs are different) to capture the screen image. This has been alluded to in a past post or two, but... where are all the SketchUp ladies? At the Super Modeler Conference in Boulder earlier this month, nineteen modelers from all over the world convened for three days of fun and discussion. And every single one of them was male. Every single one! I remade one of my models today! I clicked on the "edit model" button, which downloaded my model from the 3D Warehouse, and I made some major improvements, including new photo textures. It looked great... but when I re-uploaded the model, my revised model was not identified as the same model anymore, as it should have been. So now I have two of the same model, one good and one pretty crappy. Allison Floyd (software engineer at Google) told us "don't make a new version of the same model and upload it parallel to the old one; rather, click the edit button, download it, edit it, and re-upload. Otherwise it screws up the replacement process on Google Earth." I DID do that! Why didn't it work?! When we last saw our hero, he was signing non-disclosure agreements at the Google office in Boulder. And he joked that he couldn't say ANYTHING about the trip. Kidding! What I can share is that we got some behind-the scenes glimpses of what happens to 3D building models once they are posted to the 3D Warehouse. If you've never made a model before, it's actually quite exciting the first time it appears on Google Earth. It used to take months. Agonizing months of "maybe." Now it takes days. In fact one model I posted last week went live in less than 24 hours! BAM! I like to see visuals along with writing. So, in the spirit of visuals, here is one of my latest models. This was created using "photo textures" from Google Street View. One advantage of using Street View photos is that you are able to model buildings anywhere that Street View is available (in this case, Burbank, California, USA). During my earlier days on SketchUp Island, I had to actually visit the site I was modeling and take photos myself. Depending on the situation, sometimes I would get some funny looks. Well I am new to this blog business. But I thought it was about time to do my part to add to the wealth of crap already out there on the Internet. Hopefully my blog-- my "island"-- will be interesting enough for you to visit from time to time. The subject is "SketchUp." 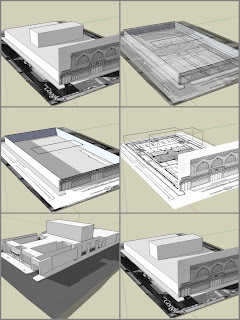 SketchUp is a free modeling program available for download from Google. I use it to create building models that show up on Google Earth and you can, too. Really. My plan is to share SketchUp stories, talk about what I do and how I do it, and maybe even interview some SketchUp Superstars.